This large Marie Therese 18 light crystal chandelier in polished chrome has an aristocratic style and features a traditional design with a modern twist. Circular ceiling mount and polished chrome frame, with barley twist arms on two tiers and masses of high quality multi faceted Italian crystal leaf and drops decoration. This luxurious, glittering crystal chandelier is perfect for adding a theatrical touch to any large room and creates a glamorous, picturesque focal point when illuminated. Height adjustable at the time of fitting, please see below for exact dimensions. 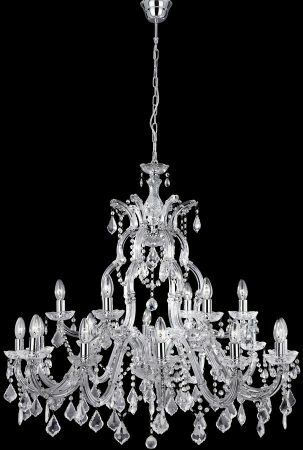 Supplied by Searchlight who manufacture some of the best traditional and modern classic designs such as the large Marie Therese 18 light crystal chandelier in polished chrome you see here.